When Rabbit goes to West Bucks Public Burrowing Library and becomes immersed in a book called Wolves, he can't wait to start reading, and buries his moist little nose in its pages on his way home. In British author-artist Gravett's series of sly pencil spreads, the wolf book's pages serve as a backdrop for Rabbit's absent-minded journey. Children will notice the appearance, menacingly close to Rabbit, of certain furry and very large animal parts: ""They have sharp claws..."" Rabbit's book tells him, while four hairy legs dwarf the long-eared hero, who stands between two evil-looking claws, ""bushy tails..."" which Rabbit, not looking where he's going, starts to climb, ""and dense fur..."" through which Rabbit, still oblivious, begins to trudge, as if it were a grassy field. Will Rabbit escape from the wolf's jaws, which his book says are ""twice as powerful as those of a large dog""? Graciously, Gravett provides two endings: one for children who long for excitement, featuring a ravaged red book cover, the other for more faint-hearted readers-take your pick. 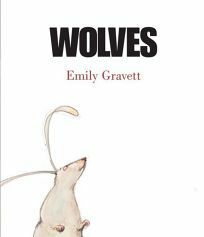 (""No rabbits were eaten during the making of this book,"" Gravett explains primly. ""It is a work of fiction."") A smaller number of children may decide the book is too heartless, but those who have grown past the fuzzy bunny stage and on to irony will howl at the fun. Ages 4-8.